The Boston Marathon is a few days away! 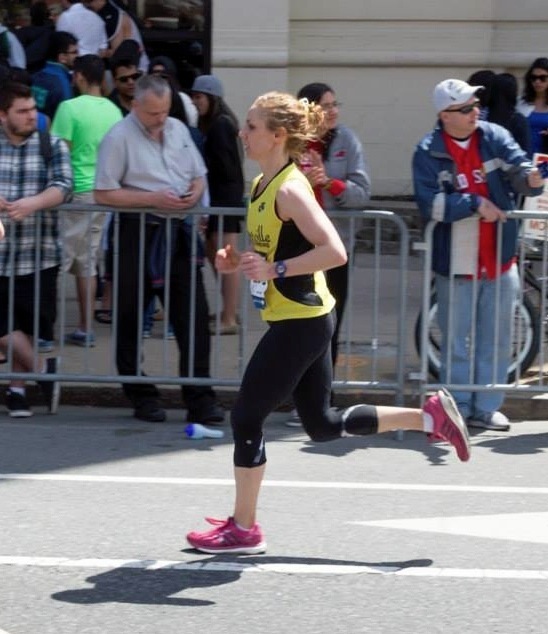 To celebrate and help runners prepare for race day, here is some advice from 20 runners who know Boston. Think positively about negative splits. May you enjoy many happy heartbeats. My advice would simply be: Enjoy each moment before, during and after and never take for granted the opportunity to be part of something so incredible. We’re so lucky to live in a world where we can rise above and overcome tragedy and create a safe, life-changing event for all to enjoy! For all those who get to participate: Don’t just run it for your own goals, run as symbol of strength and run it for all those whose lives have been altered by this race. Although I’ve personally never run this event (it is on my list of goals however), I view the Boston marathon as more than just a marathon — it’s shaped endurance sports as we know it! I’d say the most common mistakes athletes make is not going into the race truly rested/ tapered, and starting too fast. I’m a firm believer in unloading fatigue starting 4 weeks out. That doesn’t mean stopping quality sessions! It means that 4 weeks out you start to drop the volume of your easier run days and make sure that you go in to the key sessions rested. You also focus on recovery after each quality session with ~2 days of very light and short runs. Then the third week out you’ll drop miles off the quality sessions gradually. 10 days out is the last longer hard session. On race day it’s important to relax and not allow excitement and adrenaline to tempt you in to banking time. Stick to the pace plan! 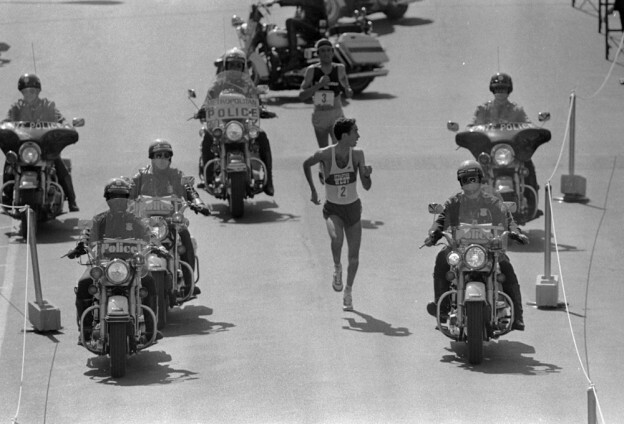 My suggestion for Boston is to remember it is just a race like any other. No magic break throughs or curses. Don’t get overly stressed, stay within your self until you get to the hills then you can get a bit uncomfortable. From the top of heartbreak to the finish you should be running just about as hard as you can nothing to hold back for at that point. 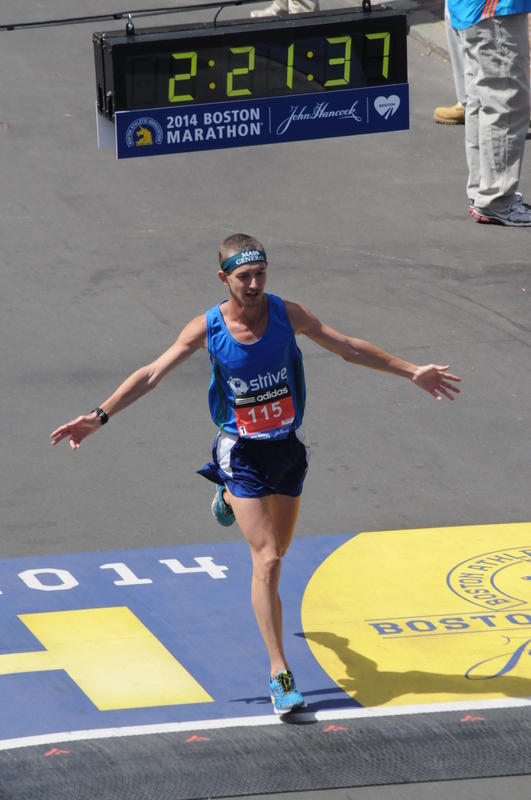 When running the Boston Marathon, patience is a virtue…and a necessity. Be very clear on your intention (your philosophy) and your goals (your strategy) before you head to Hopkinton. This will make every choice you make before and during the race easier! I elaborate on intention and goals in RACING WISELY. Boston-specific thoughts: Think of it not as two halves but as 20 miles and a 10K. If you can control yourself in the first 20, running SLOW on the downhill first seven and controlled through the hills, the last six-something miles are screaming downhill. I was told that if you are passing ANYONE in the first hour of Boston, you’re running too fast, and I think that’s brilliant advice. Take a good look at the folks who zoom past you at the start; you’ll likely see them again and can draw a huge emotional boost when you do, confirming your pacing is correct. Finally, wear sunscreen, especially on your neck, back, and calves. Even if it’s raining at the start, you’ll be glad you did. The first half of the course there is a lot of downhill and people tend to go out way to fast because of that and the large cheering crowds. Your fresh, you’ve got a lot of downhill running, the large cheering crowds, and it all feels so easy! DO NOT let that fool you! By starting out a little slower and getting your legs use to the downhills by the time you get to the uphill portions of the race your legs won’t be so pounded and you will have momentum left for the uphills, you go out to fast and those hills will feel like mountains! Enjoy the experience! 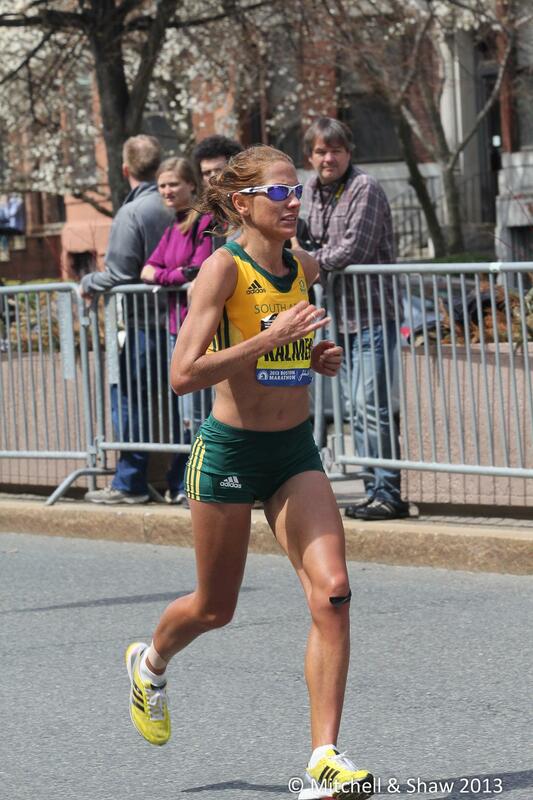 There is no race like the Boston Marathon, it is the Granddaddy of all races! 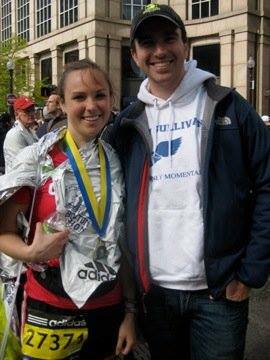 On April 20th I will be running my 12th Boston Marathon. 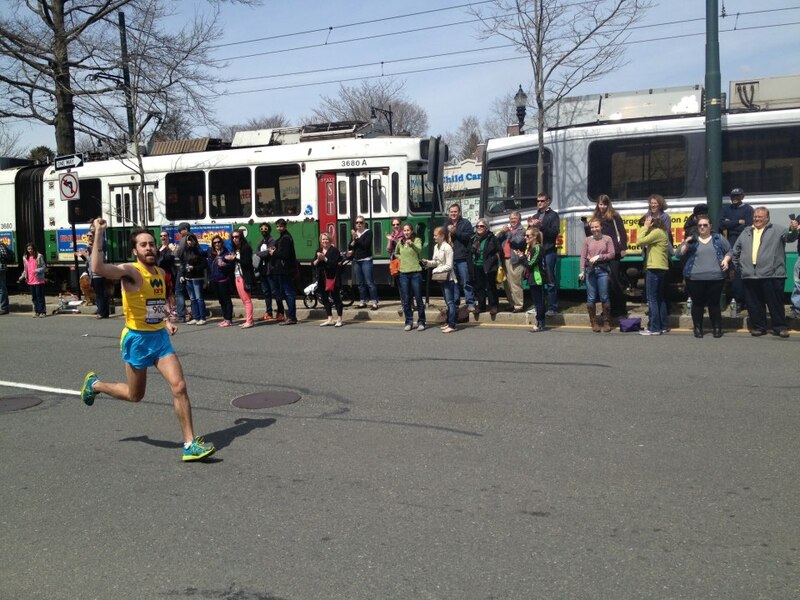 Hands down…Marathon Monday is my favorite day of the year. For those running, watching from the sidelines or afar there’s nothing quite as powerful as the energy, passion, determination, and community that pours into the hearts and souls of all involved when Patriots Day hits Boston. The best piece of advice I offer to all running is enjoy these two weeks leading up to the moment you toe the line in Hopkinton. You’ve put in months of training to prepare. Continue to run and do the additional complimentary work to keep you healthy and spry for the 26.2 mile journey, yet don’t give your energy to worry or stress. Focus on your ability to put one foot in front of the other for the opportunity to traverse one of, if not the most historic marathon course there is. (I’m a bit biased ;) There are many things we can’t control. Rain, snow, headwind, tailwind…yet your state of mind is all in your hands. Let each moment from now until you cross the finish line on Boylston Street with thousands of fans applauding and screaming for your victory be full of gratitude, respect, and admiration for all your body and mind give you the power to accomplish. With you every moment of the way. Once the training is behind, the morning is past and the starting line is finally crossed; then immerse as fully into the moment as possible. Something epic is happening with you, for you and around you. Savor it and live in the moment more than the challenge, the pain, the planning. Those moments will carry you through to the end and remain with you long after everything else is likely faded. Boston is the greatest race in the world, so be ready to race! My biggest mistake, after finally qualifying for Boston after years of hard work, was treating the race itself as a victory lap. All winter I told myself I’d “just enjoy the atmosphere,” and it took lining up in the starting corral right behind the best runners in the world for me to realize how special this opportunity was. If you’ve made it to Boston, race Boston. The Boston Marathon is only days away and your only challenge is to let yourself be by getting out of your head and getting right into your heart. You have done the training and all the physical work to get you to the starting line. Now it’s time to trust your training and believe you are strong enough to go the distance. Enjoy each and every step and take it all in. There’s no other race like the Boston Marathon and you earned that bib number. Now go have fun and do what you love doing, running! Everything else will fall into place as it should. The most important tip for Boston? Do not go out too fast! The down hill at the start is very alluring and causes athletes to start off much faster than they can handle, which can cause a very slow last 10k. The key is to come up with a pacing plan, based on the training leading up to the race, and sticking to it, no matter what is going on around you. Even if you feel amazing, do not overreach the first half. At some some point in the second half of the marathon, it’s going to start feeling very uncomfortable. When this happens people often tense up and focus on the discomfort. However, just telling yourself to relax can instantly make your body relax and deal with the discomfort a little better. When using a heart rate monitor most athletes can see their heart rates go down after simply telling themselves to relax. The best marathon times often come from even or slight negative split performances. Don’t get caught up in the excitement of the start of a race and go out too fast. Come up with a realistic time goal and calculate what your mile pace should be and stick with it. If you’re feeling really good at mile 20, that’s the time to go faster if you have another gear in you. No matter how slow you feel while running, stick to your pace. Remember, the race is 26.2 miles long. You’ll have lots of time to cover ground more quickly after the first half. Don’t forget to fuel early in the race. If you don’t it most certainly will catch up with you in the end. Once in awhile, don’t forget to look around and soak in the amazing experience you are having. When you go through a tough spot, draw energy from the crowd and those around you. Race day Nerves! Starting to feel the butterflies in your stomach with the count down to Boston Marathon. Nerves are normal as race day is creeping closer and closer. Believe me! Whether you are going for a podium spot or just aiming to concur the distance. All runners go through the same emotions in race week. Uncertainties will arise during race week. Did I train hard enough? Should I have done more and longer long runs? The best way to overcome these uncertainties, is to think back of the progress you have made, from December till now. Remind yourself of the weeks of preparation, early mornings and sacrifices you made to get you to this race. Don’t compare your training with anyone else, it will only plant seeds of doubt in your mind. Trust your training! No workout in race week can make you any fitter. Overdoing it in race week is more of a concern than under doing it. Relax! Try and get your mind of the race by doing some non-running related activities, reading a book, watching your favorite movie or just spending time with family and friends. The most important thing to do now, is to rest your body and your mind! Both times I ran Boston I got carried away by the adrenaline and crowds at the start, and ended up running too hard in the first half. Go easy! Sandbag if you have to! Give yourself a cushion so that when you get to the second half, you’ll be able to dig deep and actually have some reserves of energy. Mile 16, when you cross route 95/128, is like no-man’s land. There are less people, the hills are just beginning, and whatever the weather is, it will be worst here. Get through that section feeling strong and then relish the change of scenery after the turn onto Comm Ave. Feel the pull of the finish line drawing you closer with every step. Run on the course, and get to know the landmarks. On race day focus on getting from one landmark to the next. DO NOT think about the entire remaining distance, or your finishing time, or the new PR you might have. Focus on the moment, your calm breathing, your smooth form, and the intermediary goals. Make sure to enjoy the excitement of the Boston crowds. I highly recommend taking the opportunity to high five a few spectators along the way and fist pump the masses along Boylston Street. Sure, adding in a few unnecessary steps or momentarily breaking form might result in a couple extra seconds, but its what make Boston Boston. That race has never about PRs, its about competing and celebrating the sport of running. The Boston Marathon is the most prestigious marathon in the world – any Bostonian will happily tell you that. For the people running it, especially for the first timers, it’s important to stay focused on the task, not the hype. Stay centered. Focus on all of the preparation you’ve done and the fact that you’re ready. Match your effort to the terrain (a little faster downhill, a little slower up hill). My final advice to all of my athletes before the race is always: Be calm. Be confident. Have fun! Lots of others will talk about how to pace yourself over the course (expect to positive split), so I’ll stay away from race strategy. The most important thing? The Boston Marathon is the only race I’ve ever run where you feel like you’re at a rock concert, not a marathon. Enjoy the spectacle!